While Moscow was ablaze, Kutuzov broke off from the enemy and pretended to retreat down the road to Ryazan south-east of the capital. Then, in a shrewd tactical maneuver, he cheated the enemy reconnaissance squads, made a sharp turn westward into the enemy’s flank and took up positions on the Kaluga road near the village of Tarutino. That was the first major respite after more than three months of almost incessant retreat since the beginning of the war. Standing on the steep bank of the Nara river, Kutuzov instructed his generals: “Not a step back now. Get the troops ready, check the weapons. Remember that the whole of Europe and our beloved Motherland are looking at you”. Kutuzov’s flank maneuver at Tarutino reversed the strategic situation, giving the Russians a clear advantage over the French. Rich adjacent provinces not yet ravaged by war supplied the Russian army with food, weapons and manpower resources. “That old fox Kutuzov cheated me off by his flank march,” Napoleon later admitted. The respite enabled the Russians to build up the muscle for a future offensive. Meanwhile, Kutuzov decided to launch partisan warfare. Cavalry officer Denis Davydov commanded the first partisan formation. Shortly before the battle of Borodino, Davydov, a gallant hussar, poet and man of extraordinary courage, submitted his plan of partisan warfare to General Pyotr Bagration. “Partisans will harass the enemy and drain its strength,” he told Bagration. “Our land isn’t that rich and off-road areas cannot feed 200 thousand strong troops. There are no weapon plants or powder mills on the Smolensk road either. Besides, the reappearance of our soldiers in the occupied areas will brace people’s spirits. They will take up arms”. Bagration listened attentively to the “Achilles of Napoleonic wars” as he used to call Davydov, and promised to report his plan to Kutuzov. The latter gave his approval plus 50 hussars and 80 Cossacks instead of 1000 Davydov requested. The first raid was a success. In an impressive show of bravery, Davydov’s unit captured an enemy food and ammunition convoy and took more than 200 soldiers prisoner. Davydov had his own tactics. Avoiding direct engagements, he groped for the enemy’s vulnerable spots and attacked unexpectedly, taking the French by surprise. Local residents informed him about enemy troop movements. At first peasants often mistook partisans for the French because of the similarity of Russian and French hussar uniforms. Seeing that, Davydov dressed his men in civilian clothes. Clad in a peasant caftan, with a thick black beard and an icon of St. Nicolas the Miracle Worker hanging on his chest, Davydov put the fear of God into the French. They dubbed him the Black Leader. 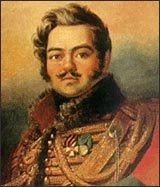 Davydov’s successful experience prompted Kutuzov to set up more partisan formations. One of them, commanded by Alexander Seslavin, deserves special mention. Apart from raiding enemy transport convoys and taking foragers and marauders prisoner, it supplied important reconnaissance data. Once, Seslavin noticed French troops massing on a road. From a high tree he discerned French cavalry guards in helmets and white cloaks escorting a rich carriage driven by four horses. Lines of dark-skin Mamelukes were marching behind, followed by the old guard – Napoleon’s pride. Seslavin was quick to guess that it was Napoleon and his Grand Army retreating towards Kaluga, of which he immediately informed the Russian command. Two days later the Russians beat the French in a fierce clash near Maloyaroslavets. Guerrilla warfare dealt a severe blow to Napoleon. He lost about 30.000 men during his stay in Moscow.